Voitko inspired by Arrested Development? Could Viktor Voitko have been “inspired” by GOB’s $100 bill trick in the TV Show Arrested Development? 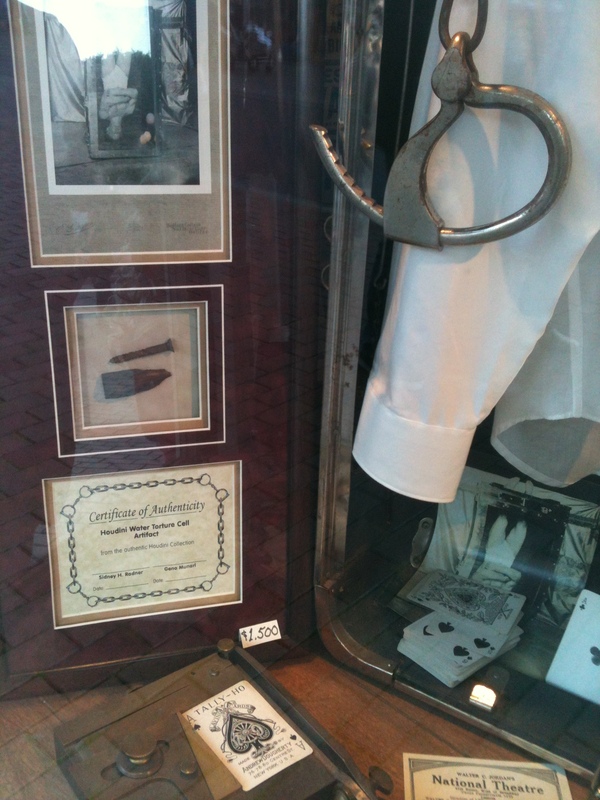 Yours at Steven’s Magic Emporium for only $315! I imagine that the final FISM 2012 scores have been published for some time, though I just ran into them. You can find them in a PDF file here. I’m particularly interested in the Stage categories. The majority of the contestants have videos of their acts published on YouTube – which allows for some pretty interesting viewing. By and large, I found I agreed with rankings overall. Here, for your convenience as well, are the scores with videos (for those that I was able to find). 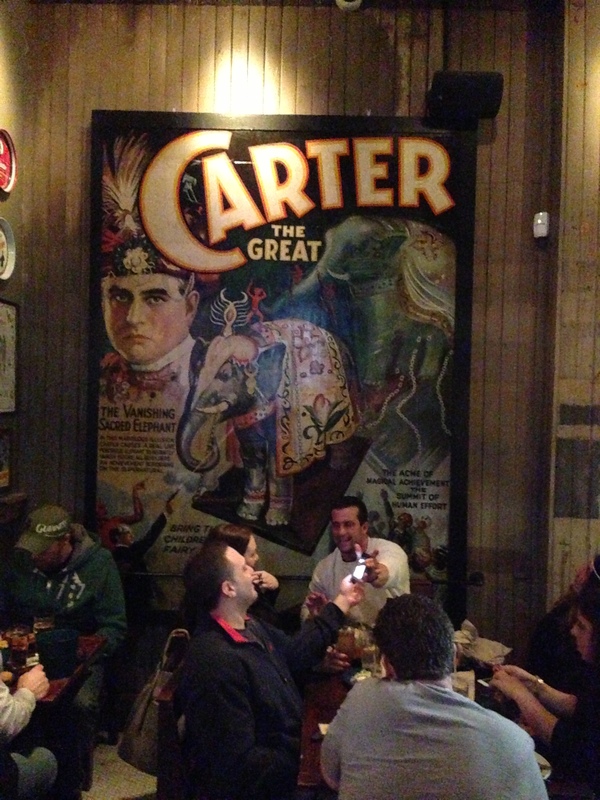 Carter’s Elephant illusion is a favorite of those who decorate restaurants with movie posters. – Robinson, Ben. “Disappearing and Appearing Elephants” in Osborne, Paul. 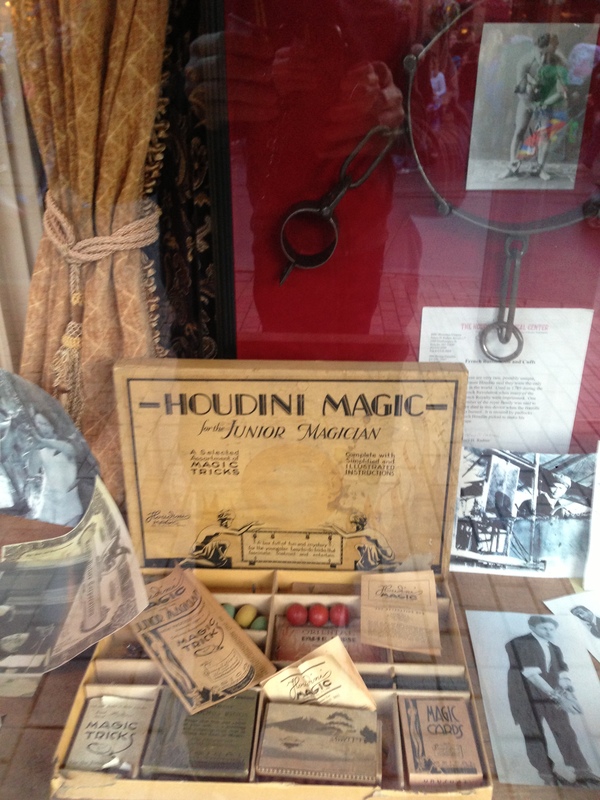 Illusions: The Evolution and the Revolution of the Magic Box. Illusion Systems Publishing: Dallas. 1995. Pp. 111-134. Cover | Full Title. As if proving Ben Robinson’s proclamation, I nearly walked past this Carter the Great poster, as I was walking out of Dinosaur Bar-B-Que in Newark, NJ. This 8-sheet was printed by Otis Lithograph around 1926. The Elephant eight-sheet you have made into a money-getter. I am sure as soon as my multitudinous friends around the world put their peepers on this sheet and the others, they will run posthaste to my box office with their golden elusive shekels, entreating me in suppliant cajolery to relieve them of their coin in exchange of feasting their senses on my many new mysteries which your painstaking efforts on my behalf have so graphically and seductively emblazoned forth in myriad greens and reds and purples royal. – Charles Carter to Carl Moellmann of the Otis Lithograph Co.
As published in Caveney, Mike. Carter the Great. Pasadena: Mike Caveney’s Magic Words. 1995. P. 226. Limited edition of 1,000 copies. Cover | Full Title. 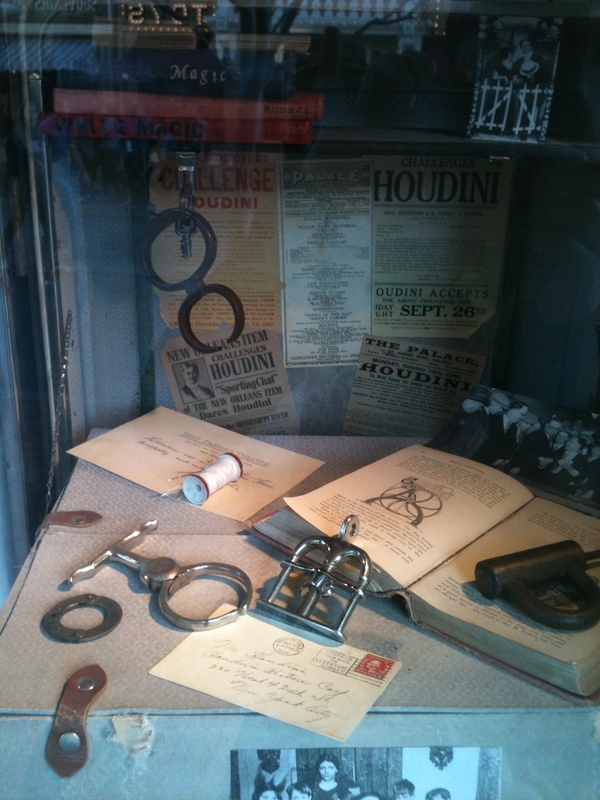 Remembering Houdini’s success with “The Vanishing Elephant.” Carter decided to build a similar illusion. Models were constructed for several ingenious cabinets, none of which met with his approval. He tried a different approach. As he visualized the feat, an elephant would stand on a platform; curtains would be lowered around it; then platform and elephant would be hauled into the air. The curtains would be raised just enough for the audience to see the pachyderm’s feet; then they would be dropped to the level of the platform. A pistol shot from the illusionist would cause the elephant to disappear. Carter built the apparatus, bought an elephant, and began to rehearse. There was an unexpected complication; the elephant would not cooperate. She bolted from the platform as it was being raised. The show opened at His Majesty’s Theatre in Brisbane in 1927 with four girls (“The Disappearing Flappers”) vanishing on the platform instead of the elephant. In case you missed it, The New Yorker published a wonderful piece a month or so back on pickpocket Apollo Robbins. Robbins demonstrated his method on me. “When I shake someone’s hand, I apply the lightest pressure on their wrist with my index and middle fingers and lead them across my body to my left,” he said, showing me. “The cross-body lead is actually a move from salsa dancing. I’m finding out what kind of a partner they’re going to be, and I know that if they follow my lead I can do whatever I want with them. – Green, Adam. “A Pickpocket’s Tale: The spectacular thefts of Apollo Robbins” in The New Yorker. Online. (Emphasis mine.) One other side note: if you are reading The New Yorker piece for the first time, don’t miss the associated video which has been less heavily linked to online. Salsa dancing, latin ballroom dancing. Hmm… What other magician had a history in ballroom dancing? Richardi, Jr. (Aldo Izquierdo Colosi). Most of the show is in pantomime. Richiardi and his assistants run out on the stage and they dance throughout the show in the manner of a modern interpretive ballet. I must stress that his dancing and positions are at all times suited to the music and has an easy grace although it is completely masculine and in keeping with his characterization of a charming young “miracle-worker.” As an entertainer, Richiardi, Jr. is very much like Sammy Davis, Jr., and as a dancer he is very much like Gene Kelley whom we see in motion pictures. 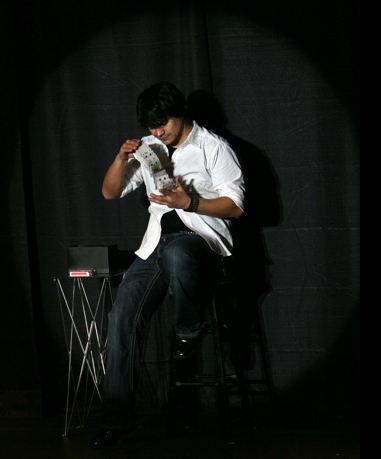 Actually, Richiardi, Jr. presents his magic on the stage as it might be presented in an Hollywood musical film. – Furst, Arnold. “Richairdi Jr:, A Review of his show at the Royal Theatre, Portsmouth, England” in Genii. Vol 20, No. 9 / May 1956. Pp. 354-357. AskAlexander (Login required). An interview in which we learn that he was also an “amateur bullfighter”! P.: You did something that very few magicians ever do: you took lessons in singing and dancing. 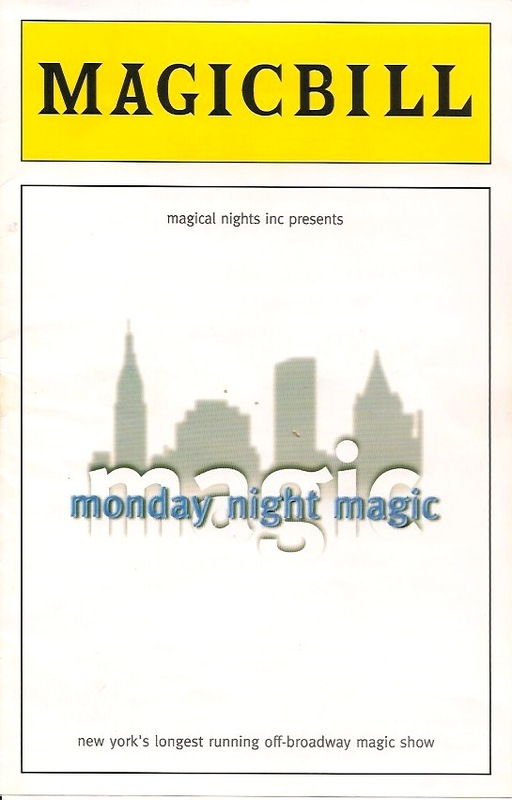 Renowned critic John Simon, whose word is almost gospel, said; “you bring theatre to magic”. What made you do that in that time . . . it’s some time ago and you were so young!? 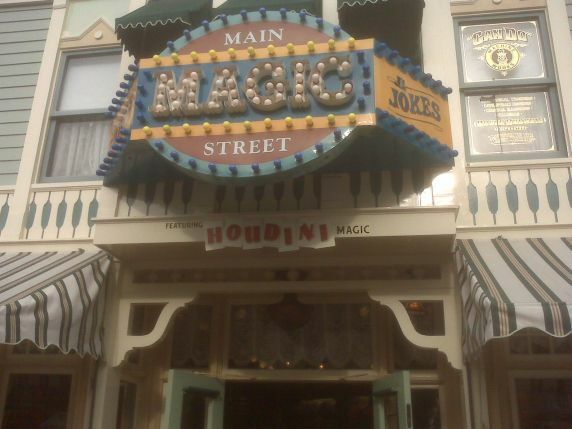 – Interview with Peter Pit at the Magic Castle on November 7, 1981. Published as an obituary in “Richiardi – The Man – His Magic” in Genii. Vol. 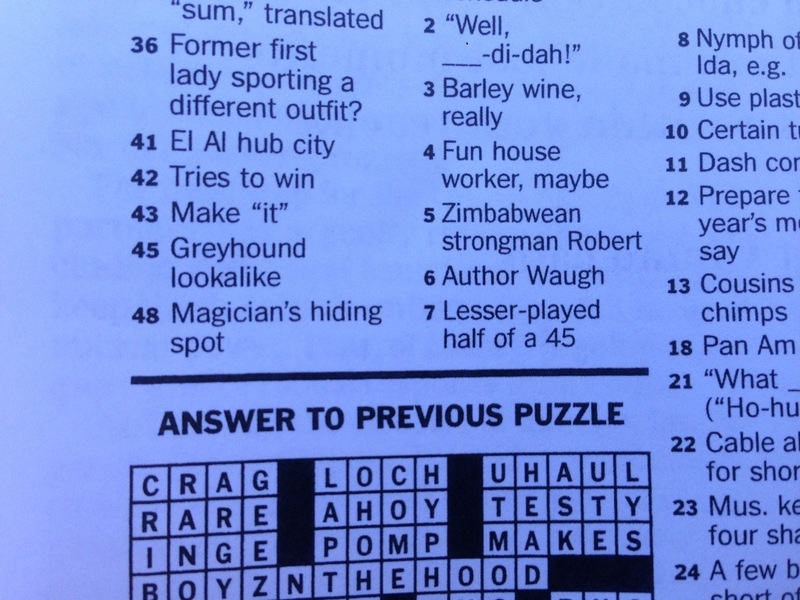 49, No. 4 / October 1985. Pp. 245-250. AskAlexander (Login required). 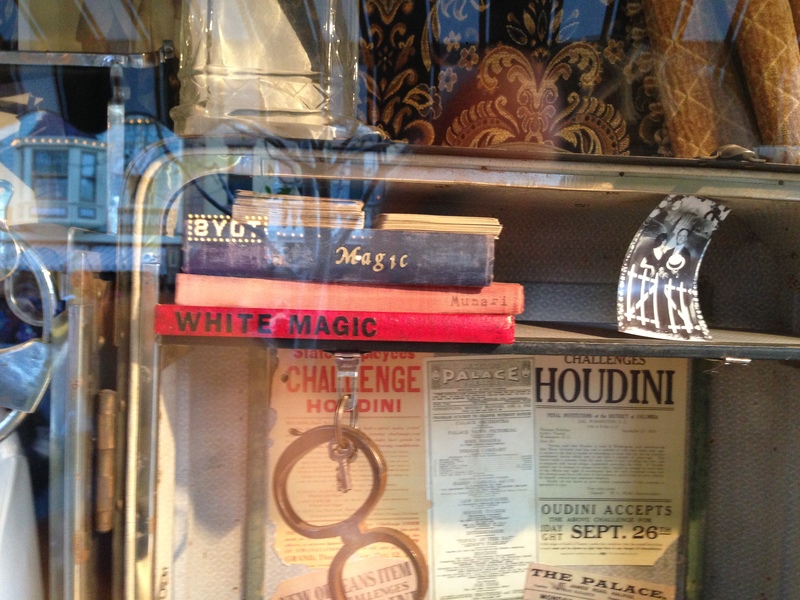 When I was growing up, watching magic acts in the 70s, basically magicians didn’t move. There wasn’t a lot of dance, other than Richiardi who put that kind of Latin fire in his movement and a lot of these adagio and kind of flamenco Latin poses in his show. – Jeff McBride, interviewed by Eugene Burger in “The Showmanship Interviews” Genii. Vol 74, No. 5 / May 2011, Pp. 60-63. AskAlexander (login required). I feel Richiardi’s broom levitation, in particular, displays the influence of his roots in Latin dance. Have a look at this (unfortunately very low quality) clip of the Richiardi levitation (at beginning and end). I subscribe to the Oxford English Dictionary word of the day e-mail. “Alakazam” was the word selected for March 1. Forms: 19– alagazam, 19– alakazam, 19– alakazap, 19– alakazoo, 19– alakazoop, 19– alakazot. Etymology:Apparently an arbitrary formation, invented to sound like a word in an unspecified foreign language, with the intention of creating an air of exoticism and mystery. In use as a magical exclamation perhaps approximately suggested by abracadabra n., although compare discussion below. 1881 Daily Evening Bull. (San Francisco) 6 Aug. 1/5 Camp Capitola. Description of a New Seaside Resort in Santa Cruz County… The party who laid out the streets..gave vent to his facetious bent in naming them. Glancing at the names..are seen Fishbone avenue, Alagazam street, Rat Tail alley and Soda Water avenue. 1884 Hawaiian Monthly May 119/2 At this point the conversation was interrupted by the tones of a deep, rich bass voice belonging to a gentleman, who sat directly behind the alagazam idiot: ‘Asinus, asini, asiniorum’. 1896 N.Y. Tribune 24 May 17/6, I ain’t had a square meal sence Been fillin’ up on Charley horse rusies, sooflay de allakazam, an’ all them French dishes. 1902 A. Holzmann ‘Alagazam!’ Cake Walk, March and Two Step 3 The theme and title of this composition suggested itself to the writer during a trip to the South where he saw a colored regiment, who, while marking time during drill..were uttering a peculiar refrain which sounded like—Alagazam! Alagazam! Alagazam! Zam! Zam! 1903 A. Holzmann Alagazam. Song. 5 Zam Zam Zam was the title they gave him Zam Zam Zam our mighty Alagazam. With the explanation given by Holzmann for the title of his piece compare the later composition by Harry von Tilzer and Andrew B. Sterling entitled Alagazam to the Music of the Band (1915). With forms showing apparently arbitrary variation in the final syllable (as alakazoop, alakazoo, etc. ), compare the following comic song, where a different alteration of Alakazam (apparently presented as though the name of a foreign country, state, or city) features in each successive verse (The Countess of Alagazoop, The Countess of Alagazip, etc.). 1904 R. Cole Countess of Alagazam 3 They christen’d a girl somewhere in the world, The Countess of Alagazam. It has been suggested that the expression arose in the medicine shows that toured America in the late 19th and early 20th centuries, although contemporary evidence to confirm this appears to be lacking. 1904 Philadelphia Inquirer 28 Apr. 9/5 ‘Alagazam’—To make your eyebrows heavier apply daily with a small brush a lotion of olive oil..bay rum..quinine. 1920 El Paso (Texas) Herald 10 July (Comic Section, Katzenjammer Kids), I am Professaire Dopo Ze Hypnoteest! I get your lettaire!.. Alakazam! You sleep! When you wake up you are good leetle boys! 1930 Daily News (N.Y.) 2 Mar. (Final ed.) 35/1 ‘Alagazam’..is a term in wide use among members of a profession which has long sickened reputable physicians and honest druggists, not to mention the general public. 1951 in Newslet. Amer. Dial. Soc. Sept. 22/1 The whirlwind courtship of Elmer Sitts… With Elmer and Gladys it was just slam, bam, Alakazam! Timber! This is it! 1988 N.Y. Post 21 Oct. 10/1 Sit down with these guys and—alakazam!—you’re in the Broadway world most folks thought was long gone. 2009 N.Y. Times (National ed.) 30 Oct. a23/1 He is unlikely to be judged kindly by subway and bus riders if they do not see—alakazam!—quick improvement in fraying service. Here is how the name “Allakazam” came about. Certainly, the tie-in with the “Wizard of Oats,” who magically created All Stars, was a natural for a magic show. To strengthen that association, “Allakazam” was incorporated into the show’s name. The word Allakazam itself has a magical connotation. The Wizard sang in the commercials …”Kelloggs All Stars, Allakazam. What a wonderful wizard I am.” Now that was a direct tie-in with that new product. Even more specifically, Allikazam was written with two lower case “l”s. This was to position the “K” as the center letter … AllaKazam. In that way, whenever the word AllaKazam was seen graphically, such as when it appeared at the top of the street sign-post on our primary set, it had the giant Kelloggs “K” logo as the middle letter. – Wilson, Mark. “The Inside Story. Number 5.” In Genii. October 2003/Vol. 66, #10. P. 24. Ask Alexander (login required). I thought I would continue with the last posts’ Disneyland theme. While The Haunted Mansion is a bit too obvious of a magic tie-in, there are other bits of video-reflected Pepper’s Ghosts hidden in the Sleeping Beauty’s Disneyland Castle Walkthru, in Finding Nemo Submarine Voyage, and others. However my pick for best use is hidden in the middle of the Monster’s Inc ride. Here the restricted viewing angle (and even symmetric periphery) is perfectly justified by its placement within a shower room scene. 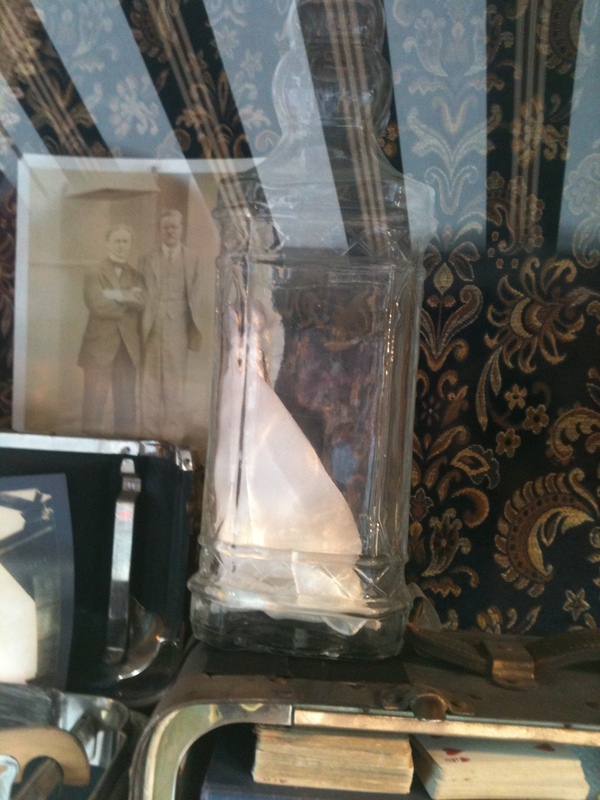 The setup is almost a “Blue Room” arrangement, though the effect is definitely Pepper’s Ghost. Equally, it’s disappearance perfectly motivated by the chameleon character being, well, a chameleon. 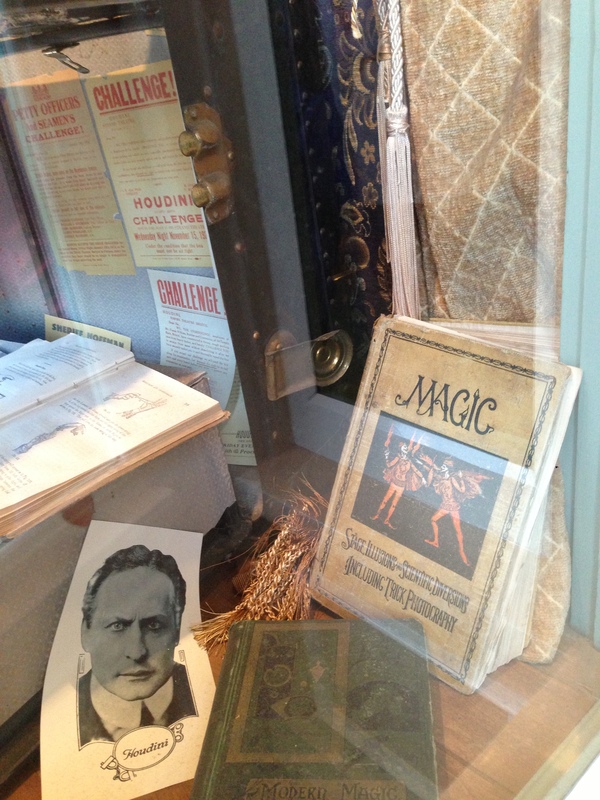 Houdini’s traveling trunk – the focus is on Houdini memorabilia. tricks for guests inside the shop. article with additional photos can be found here. 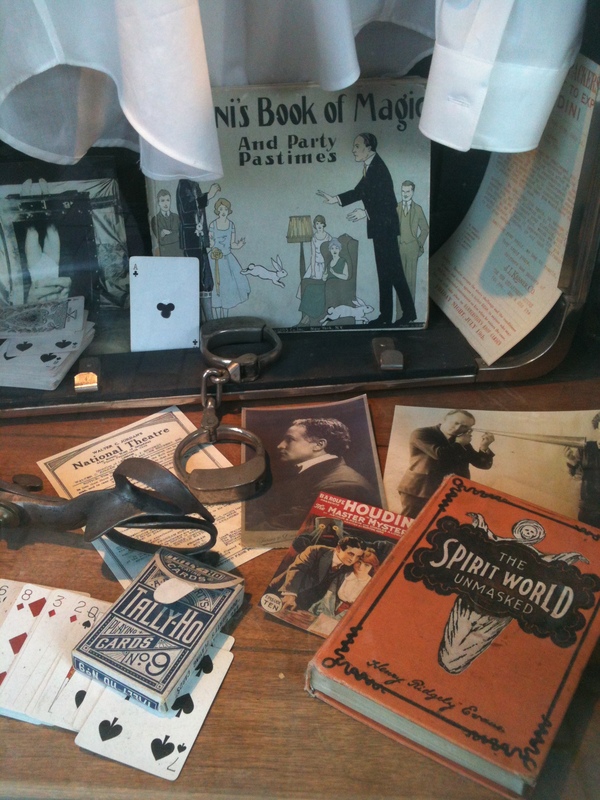 The primary function of a magic book, of course, is to teach magic secrets. It’s the contents and clarity that are usually the focus of the reader. But sometimes, the form is interesting, too. I think I first began paying attention to the form of the book – the layout and design of the words and pictures on the page – when I laid eyes on Jim Steinmeyer’s The Magic of Alan Wakeling. In the unorthodox layout of this book, a full three inches of whitespace lie atop of most pages between the header and the start of the text. Roughly 1/3 of the every page is unused. What a strange and interesting design choice, I thought at the time. Now, I cherish its uniqueness of the design among a sea of Times New Roman, header-to-footer volumes. There are many others with unique looks as well. 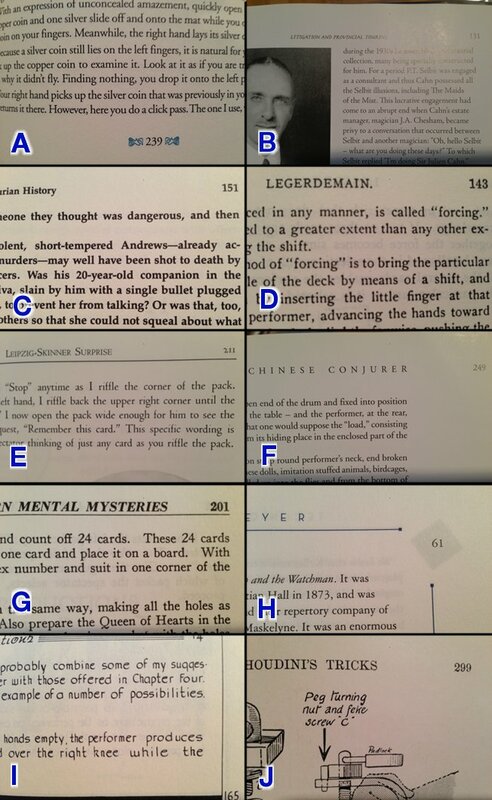 Rather than list my favorites – how about a game…With just a few inches around the page number – how many of these authors/volumes/publishers can you recognize? Scroll down for a list of titles if you need a hint. Answers at bottom. Enjoy! A – 10. The single color blue dingbats surrounding page numbers were the give away for this influential book. B – 3. A tough one, for sure. Though consistently quality in subsance, the thing most inconsistent in Mike Caveney’s Magic Words publications has been their style. The fonts and layout have changed from book to book in the “Magical Pro-File” series, but never quite settled. It has improved considerably over time, but reached it’s pinnacle – in my mind at least – here with Lyle and Dawes’ excellent history. C – 1. The Booth books. Their constant, nonsensical use of “10-point Palatino Bold” in the body text, as proudly proclaimed in the Colophon (itself, a rarity in magic texts). What to use for the headers when the text is all bolded already? Well, Garamond bold, to be sure! They design was apparently dictated by John Booth himself. D – 4. Nothing special in the layout here. Typical of any turn-of-the-century text. However, as arguably the most studied text in magic, I thought it would be interesting to see how recognizable it was in excerpt. E – 2. A tough one here – the oval photograph cut-off at bottom might have been the only clue. I’ve never felt this John Carney masterpiece got the distribution or reception it deserved. The number of artistic choices made in this book is staggering – from delicate font, the chapter heads, the processing of the photos to near-illustrations and their placement in-line. The book approaches perfection in teaching – and a book that can be returned to again and again as the student progresses. F – 6. Unlike the Caveney books, Todd Karr has had the same template design for his books since the beginning of The Miracle Factory books. That includes the design of his e-books and even book tests. The design is simple, subtle, and places the focus on the contents – which generally need little assistance in shining. G – 9. No bastion of layout here, but with eight volumes forming the core of most magicians’ education, hopefully the Tarbell course was somewhat recognizable here. I – 7. Francis B. Martineau’s hand-lettered 3-volume masterpiece (not be sullied by that computerized fourth volume typographical monstrosity…) should be instantly recognizable. A genius testament to is dedication, unlikely to be equalled again in this lifetime. J – 5. The key here was the diagram. Often of a barely-thought-through explanation of another performer’s work; one that passes muster for the minute or two you are reading, but fails miserably in practice. I am writing, of course, to the works of Will Goldston.